148 Battery ('Meiktila') is a unique unit of specially trained men from the British Army and Royal Navy tasked with calling in artillery and air strikes in support of UKSF and 3 Commando Brigade, Royal Marines. Members of 148 Battery come ashore in an inflatable raiding craft. The men of 148 are commando trained and parachute trained and are proficient in stealth insertion via parachute, boat and helicopter. 148 Battery Fire Support Teams (FST) can accompany UKSF teams into action, using their specialist skills in controlling artillery and air strikes. Their particular expertise is in calling in Naval Gunfire Support. Fire control computers and gyroscope guns on modern British destroyers allow for highly accurate shelling of targets. The battery supplies FSTs for the Brigade Reconnaissance Force (BRF), 3 Commando Brigade. 148 Battery share a base with the Special Boat Service, at Poole, Dorset. During the 1982 Falklands conflict, 148 Battery teams linked up with SAS and SBS units for several successful missions which included the shelling of Argentine positions on West Falkland and in and around Port Stanley on East Falkland. 148 battery took part in the 1991 Gulf War, including the retaking of the British embassy in Kuwait, in which a 148 BTY team inserted into the embassy compound with the SBS. Later in 1991 they took part in Operation SAFE HAVEN in Northern Iraq. 148 Battery deployed with 3 Commando Brigade as part of Operation Telic, the British component of the US-led invasion of Iraq. 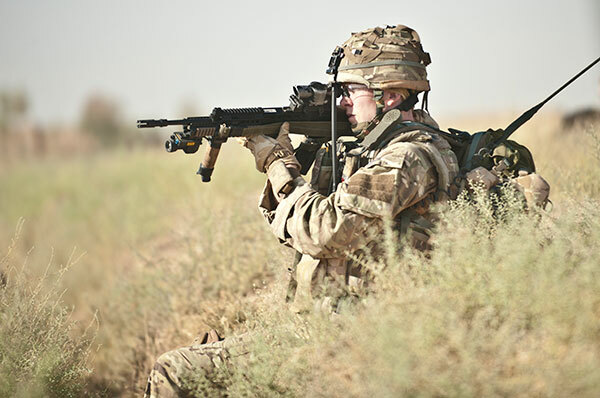 Fire Support Teams with 148 Battery have deployed with 3 Commando Brigade on tours in Helmand Province, Afghanistan. 148 Battery are organised into an HQ element, supporting elements (admin, logistics etc) and a number of 5-man Fire Support Teams (FSTs). Each FST is typically led by a Patrol Commander, a Royal Artillery (RA) captain, with an RA bombadier as second in command. Each FST also includes a Royal Navy Commando signaller. The remainder of the FST will be RA lance bombadiers or gunners. If needed, FSTs can split into 2 teams, the second team being led by the bombadier. In the past, the men of 148 Battery used the M16A1/A2 as their main personal weapon but nowadays they are reported to have recently switched to the SA80a2. A 148 Bty FST member may be armed with a L7 GPMG or Minimi light machine gun. A Commando with 148 Commando Forward Observations Battery Royal Artillery pictured on patrol in Afghanistan.